This is the tribute I presented at my grandmother’s funeral on 19 September 2012. ELLA BAXTER nee FICK – 4 December 1919 to 12 September 2012 – aged 92 years. Today I stand before you to speak on behalf of the seven grandchildren and four great-grandchildren of our Nan, Ella Baxter, affectionately known as Nanny Baxter. Knitting, baking cakes, crochet, Sudoku, cooking, craft, needle work, card games, kind, quiet and family…. These are all words that make me think of my grandmother. Nan was such a wonderfully devoted mother, grandmother and great-grandmother. She was someone who loved to give. She always provided for her loved ones and was always selfless – whether baking (ginger fluffs), crocheting, knitting, or running the household – never putting herself first. She loved swans, Princess Di and the old dog Toy her and Pop used to have…. Nan was a walking piece of history – she grew up during the Great Depression, met and married Pop in the early 1940’s and raised her children during the Vietnam War era. She certainly lived a full life and nor was it dull. A couple of years ago, after her 90th birthday party, I wrote an article about Nanny on my personal blog. I wrote that she was an independent, strong-willed and sometimes stubborn woman living on her own in a two bedroom unit, who was still buying her own groceries and crossing busy main streets in areas where trucks could wipe her clean. I swear this woman lived more than nine lives. My Mum told me that when her and Dad announced to Nan and Pop they were expecting me, the very next day she had knitted a pair of booties. That was Nan. She was a master craftswoman – a gifted embroider who used to make us many dresses when we were little girls and shirts and pants for the little boys. The kind of craftsmanship that existed only in her generation. I have many memories of visiting her and Pop at the old blue house in George Street getting measured for a new dress she was making. I remember because I used to squeal when Nanny measured around the hemline with pins that sometime used to prick. But she not only made her grandchildren clothes, she used to make her own clothes too. Pop would measure around her hemline with pins while Nan stood on the kitchen table. She was a real multi-tasker. Nan was also gifted at needlework and crochet. She once made the grandchildren a doily of the Sydney Harbour Bridge and had it framed for us. She was quiet and observant and she had an unassuming quality about her. My brother Trent recalled a story when we were all over at Mum and Dad’s house last year that she pointed out his watch had stopped working from across the kitchen table. Trent did not know at the time but it did not pass by Nan. She was observant as ever. I have many memories of her baking cakes … lots of birthday cakes. I think every year up until I started high school she baked me a birthday cake. One year there was a dolls pram, the other a swimming pool, the next a tennis racket and many more. They were all from the Women’s Weekly children’s cookbook, which I vividly remember used to sit in her draw. I used to look at it all the time. I was in awe of that cookbook. It wasn’t only birthday cakes. She was in demand for wedding cakes and her work did not go unnoticed. She had won quite a few prizes at the Traralgon Show. I always loved having Christmas with them. Every Christmas we would go around to Nan and Pop’s house and decorate their Christmas tree and help them put up their decorations. It was also a wonderful opportunity to see my cousins and eat Nan’s delicious home-cooked food. She used to make the best roasts and she always put a coin in the Christmas pudding. When she moved into the unit after Pop died, I would often arrive to visit her playing Sudoku or patience, with a bag of sweets nearby and the footy on the TV. She loved to watch the footy and was a Collingwood supporter – something that has been inherited into the family. She used to say there was nothing on TV when the footy finals were over. But she also enjoyed watching 60 Minutes and many of the game shows such as The Price is Right or Wheel of Fortune. Maybe it was Larry Edmar she had her eye on or perhaps it was Ian Turpie. 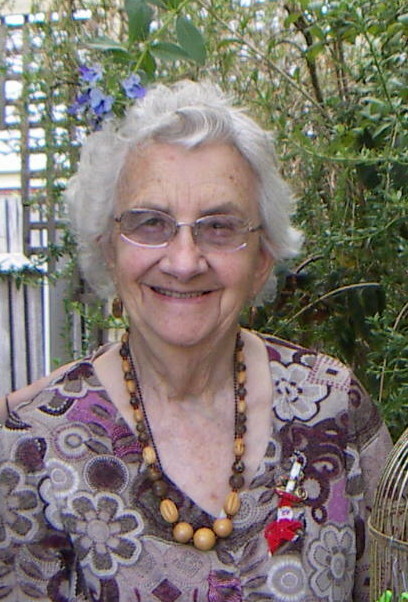 She was an environmentalist before her time – growing her own vegies, putting food in the compost, saving water by the buckletload and leaving the lights off as long as possible. In her later years she was kept company by Suzie, the little white dog. Her unit and the blue house in George Street used to be littered with trinkets from her travels her and Pop used to go on – she was quite the world traveller…, which clearly has been inherited to some of her grandchildren too. She has been to the USA, Canada and Europe. She saw most of the national parks in the US such as the Grand Canyon and Bryce Canyon and she especially loved Vancouver Island in Victoria, British Columbia. Nan survived breast cancer twice, had that many falls we lost count yet she had never broken a bone. She was a battler and often at times, refused to accept help when offered to her. A couple of years ago we could see she was starting to need some help around the house but only for someone to come around once a week to assist her with the housework. When they left, she went over what they had already done and soon enough she cancelled the service altogether, to the dismay of her sons and daughters in law left shaking their heads in disbelief. When her unit was sold and her possessions had been sifted through, we uncovered an extraordinary amount of household items only seen and found decades ago, antiques, doilies, old recipes and cookbooks to name a few. But what surprised us all was the amount of possessions she never used and many that had never been opened or seen the light of day. Beautiful old fabrics and materials, tea sets and cutlery sets – most that had never been used after saving for a rainy day or perhaps she thought they were too good to use. Her sense of humour never went away. The last time I saw her was only a few days before she passed away and she never failed to ask, with a cheeky smile on her face, if I found myself a boyfriend yet. “No Nan, I’m still looking…” I replied. And let’s not forget she adored Princess Diana and later Princess Mary, whose portraits she had in photo frames sitting on her glass cabinet. One would think they were part of the family too. Nan, you will forever be remembered, we love you and we will miss you and may you rest in peace. If you like what you’re reading, you’re welcome to sign up and receive new posts delivered to your email inbox. ~ by Shae on September 20, 2012. What a great tribute. It sounds like your grandmother was much like super woman. You have been able to recollect so many wonderful memories that paint a clear picture of the special woman your nan was. I wish your family the best and strength to deal with having to miss her. As you said she is in a better place but it takes some times to fill the void. Shae I have just read your very moving tribute to your “Nanny Baxter”. What can I say- this is a lovely and moving tribute to someone who you obviously loved dearly. She would have been very proud of you to be able to stand and say such wonderful things about her. Certainly one in a million, we seem to have lost those many talents that the wonderful women from her era were gifted with. Love and thoughts are with you and your family. This bought tears to my eyes, in a nice way my nan was very precious to me as well, having raised me she was really a mum/nan. It has been over 20 years since she passed and I think of her everyday. And even hear myself quoting her old sayings! Fortunately no one can take our treasured memories away. Would you tell a man that he had only days to live?